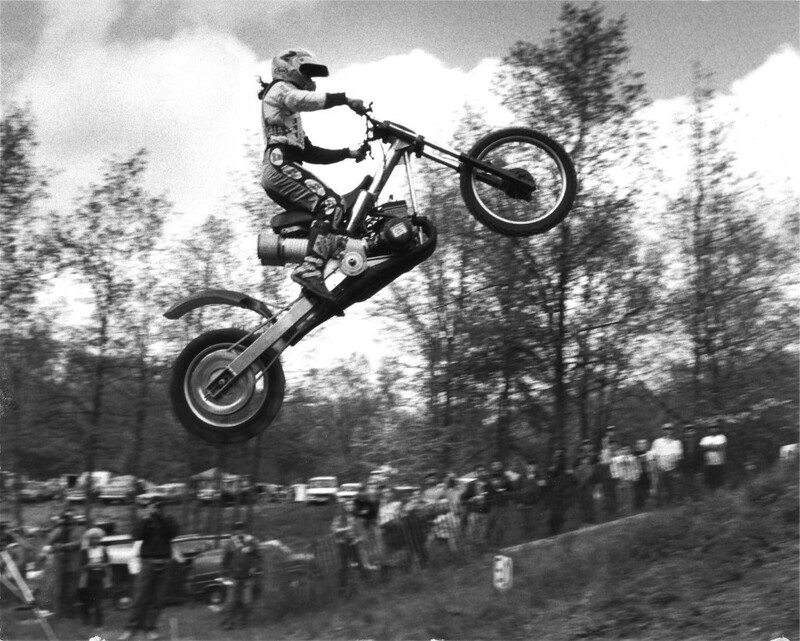 Ted Wilkins was an active and very successful competitor in the AMA Pro Hill Climbing Circuit from 1984 – 2000. 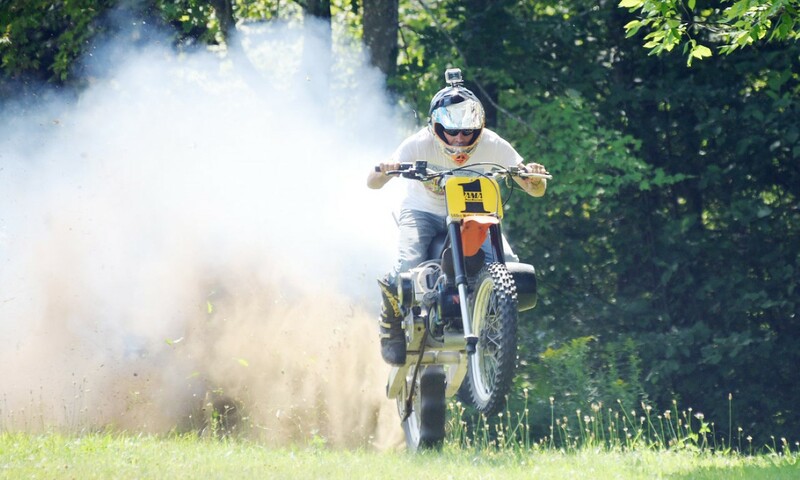 He started out on a modified Triumph and in 1990 built a custom made, multi time winning, Rotax snowmobile engined, nitro burning, powered beast of a motorcycle hillclimber that is now legendary in the world of Pro Hill Climbing. Ted is an amazing self-taught designer, engineer, fabricator and top competitor. He has also designed and built many street bikes with his Rotax powered concept. When all goes right on his motorcycle during a good hillclimb run, Ted Wilkins says everything just slows down and he can see it all. “You don’t have time to think, it has to be instinct,” says the Kinmount resident. From the thrill of hanging onto more than 150 horsepower for dear life, to the grit it takes to run each hill 10 seconds at a time, knowing full well his body would feel it for the next week, Wilkins wouldn’t change a thing about his racing career. Wilkins honed his skills working at motorcycle shops in the Ajax area as well as riding motocross, usually on dirt bikes. 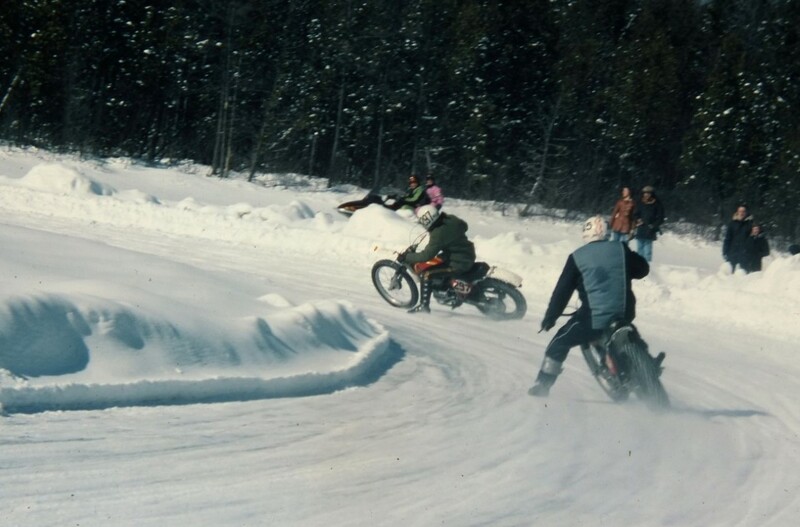 Even though he raced motocross in the 70s, it wasn’t until Wilkins started having success on his bike in hillclimb events, particularly at Bill’s Hills in Wilberforce, that he decided to apply for his licence to join the Pro Circuit and got it based on his success closer to home. His first pro race on his alcohol-running nitro methane Triumph motorcycle was a real eye-opener. “The first few years hillclimbing down there was a real steep learning curve,” he says, adding that he kept blowing out his engine. To solve that problem, Wilkins started using a snowmobile engine instead because it was not only light, but reliable. “No one thought it would work,” he says of his Rotax 521 Ski Doo engine bike. But work it did, earning him third in his first race. “I think I got a few hundred bucks, a case of beer and a trophy, so we were pumped,” he adds with a laugh. Being the only one using that kind of engine in his 540 class, Wilkins started to prove himself a worthy competitor, working his way up to the top spot in his division, earning the number 1 plate in 1999. 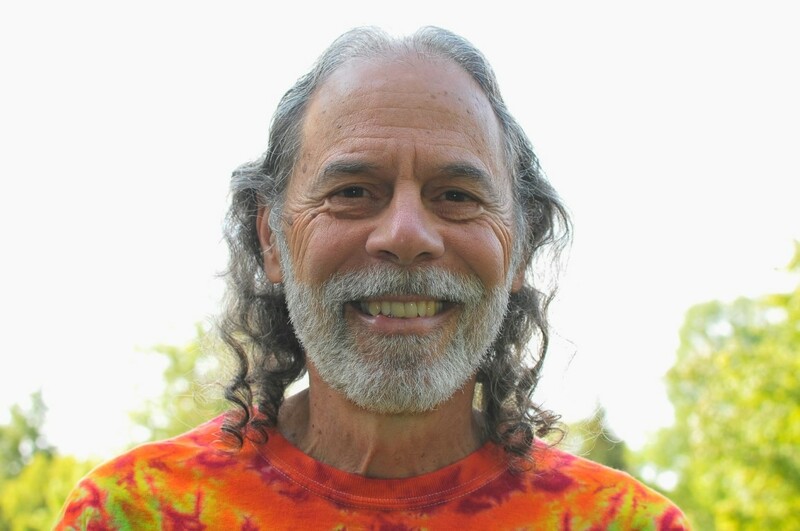 After spending three years working at IBM in Toronto, Wilkins moved to Kinmount in the early 1980s, working at Lindsay Cycle and eventually the Peterborough campus of Fleming College, where he taught Computer and Technology for 20 years. “I would be marking papers on my way to races,” he recalls, adding that some weeks he would only get home with enough time to grab a shower and head in to work Monday morning. Getting to travel across Canada and the U.S. with the American Motorcyclist Association circuit and getting to share his passion for hill climbing with his wife Bonnie, and kids Kayla and Aaron, especially during the summer months, made the hectic pace worthwhile. The camaraderie among riders also stays with Wilkins as a high point of his racing days. This sense of community was never clearer to Wilkins than when the AMA decided to change its rules on alternative motors, which would effectively kick Wilkins off the circuit. “The riders stuck up for me so the AMA decided to grandfather me,” he says. “I’m probably the only guy to have my name in the AMA rule book,” he adds with a proud smile. Ted achieved the status of #1 AMA National Hillclimb Champion in 1999 and competed with his #1 plate in 2000. When Ted retired later that year, he was at the peak level of his career in competition. Due to his work and family responsibilities and also the high level of physical stress in competitive hillclimbing, Ted decided he had enough and officially retired from Professional Hillclimbing in 2000. Now, having retired after 11 years on the pro circuit, and from his teaching job, Wilkins has turned his Triumph back into a street bike and has taken on a few other builds over the years. “I am trying not to take on any more projects,” he laughs.